I apologize for the spacing problems with this post. I want ... wait no NEED Hate That Cat. Love That Dog is sooo sad, though! 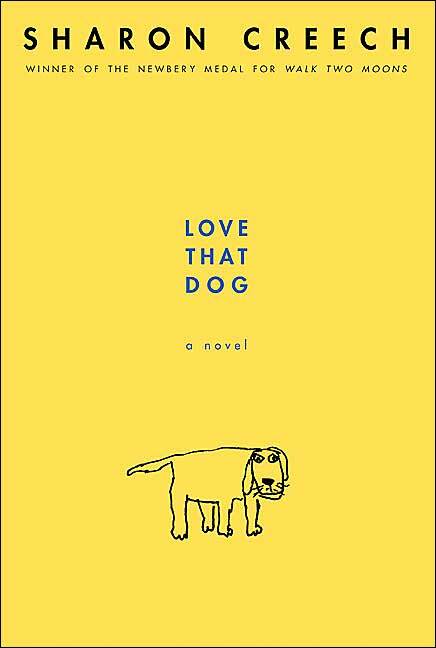 Love That Dog is about a young boy named Jack,who's in school learning about poetry. In the beginning of the book he"mocks"real poems that they read in class by rewriting all the words to explain how he doesn't get poetry at all. Sometimes, he'll write a poem using the same style and say that he doesn't get why the poem is about that specific topic. 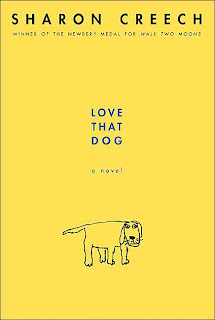 Before long the book turns into him writing poems about his dog, Sky. Over the course of the book Jack gets inspired by a poem written by Walter Dean Myers. Soon he writes Walter Dean Myers a letter asking him if he would come to his school. I like the fact that this whole book is written in poems. My favorite poem that she writes is the mocking of Tiger Tiger by William Blake (that I typed earlier in this blog post). I think I like it because my school's chorus sang Tiger Tiger so when I read that poem I heard my school chorus singing those words. I think a very cool thing about this book is that in the back of it is all of the poems that he references in the book. This book is a good book for people of any age, yet some people may cry more that the others (like my aunt and I). For the younger people the fact that it is written in poems helps them because they can stop at the end of each line and process what they just read. I think it is also good for older people because they will (probably) recognize the poems that that she uses in the book. Plus, it's a book that you can read (and finish) when you don't have the book you are currently reading. I hope you love this book like I did! Warning: I recommend you keep a box of tissues with you while you read this book. Also, Hate That Cat (the sequel) is already out. This sounds wonderful, Maggie - such a unique approach to a novel! Thanks for including one of the poems in your review so I could see what it's like. The book sounds very clever. I will have to check it out. maggie i wanted to no what qualities meas when they say it this way what qualities about this character do you most admire ??why? ?